Introduction to dentistry; the dental healthcare team; role of the dental assistant; tour of the dental office with explanation of the rooms; anatomy of the face and oral cavity; tooth anatomy, identification and location. The chain of infection; types of infections; methods of disease transmission; Roles and guidelines of both OSHA and the CDC; personal protection; disinfection and sterilization. Radiology equipment; radiation effects; radiation safety; film and digital; intraoral radiography, extraoral radiography. Students will have hands on training in greeting, seating and dismissing the patient, as well as taking vital signs, charting treatment, Syringe set up, topical anesthetic placement, transferring instruments, identifying dental materials, controlling moisture using suction, cotton rolls and a dental dam. Set up and identification of instruments for specific procedures; fillings; matrix systems; teeth whitening; crowns, bridges and veneers; provisional coverage; dentures; implants; endodontics; oral surgery. Students will learn the different types of medical emergencies encountered in the dental office and their role in dealing with them. Emergency kit items will be identified and students will understand the purpose of each item. Students will learn CPR and will be certified. Students will learn how to create a resume and how to interview on the phone, in person and clinically. 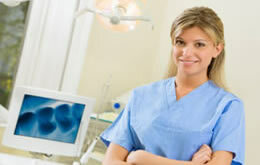 Students will take the required course and exam to be a Registered Dental Assistant. Students will be able view and assist in a working dental environment taking the skills learned in earlier classes and applying them to real life job situation. If you enjoy working with people, have great communication skills, enjoy working with your hands then dental assisting is the career for you.